This remarkable plant, once known as black snakeroot, and cultivated from its underground parts, is highly prized for its ability to assist with a variety of health concerns, an herb especially important for women. What goes on underground is what you need to know, as it’s the rhizomes below the earth, as well as the roots, where black cohosh cultivation for consumption is found. However, above ground when in bloom, black cohosh sprouts little white flowers that some remark as smelling rather unpleasant, even while attracting prolific pollinators, such as bees, flies, and gnats. Way back, before America as we know it today, when Native Americans were the guardians of the land, the use of black cohosh to address everyday health concerns was common. The Native peoples discovered how powerful the plant was in assisting with not only debilitating gynecological issues, but they found it to be healing for sore throats, kidney issues, and even depression. After European settlers arrived, black cohosh continued to be utilized medicinally. Come 1830, this remarkable plant made its debut in the U.S Pharmacopeia, but was called something else: black snakeroot, which makes sense when you understand that the parts of the plant that provide the medicinal magic are the rhizome and root, both snakelike in appearance. 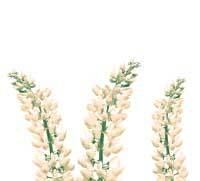 Today, the root is harvested and ground into a fine powder, which is then steeped into an herbal tea. What Does Buddha Teas Black Cohosh Tea Taste Like? 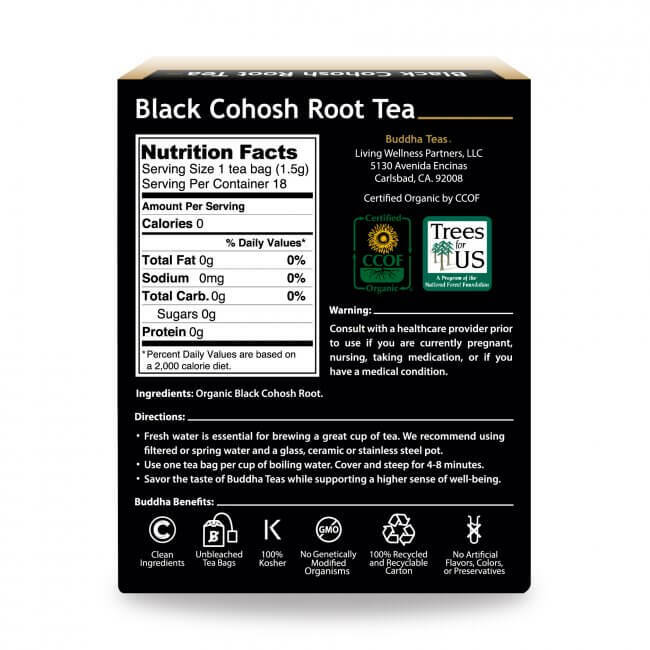 Just because your cup of Buddha Teas Black Cohosh Tea smells a little like the earth, doesn’t mean this remarkable herbal tea is going to taste like dirt. Far from it! Though its taste is mild, and somewhat undistinctive, there’s enough of a personality there to transport you to a place in time when your need for medicine was found in the open spaces surrounding you. 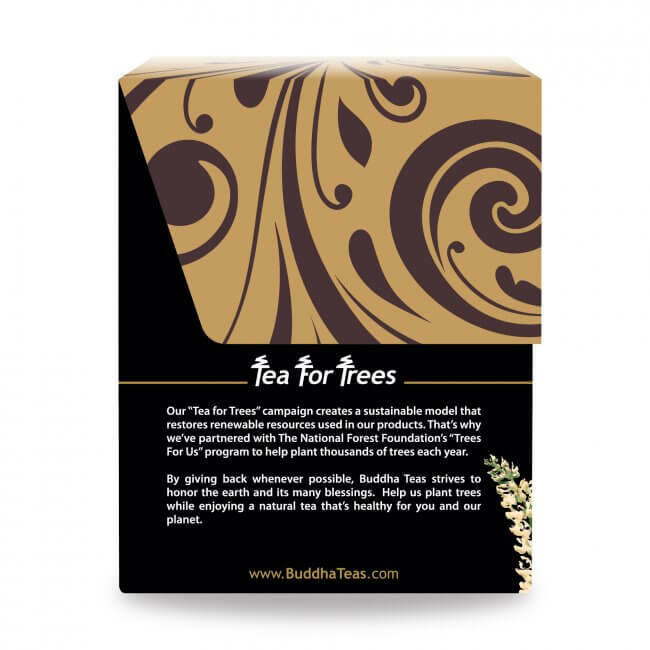 We believe this is one you’ll want to keep in stock, a tea you’ll turn to again and again. 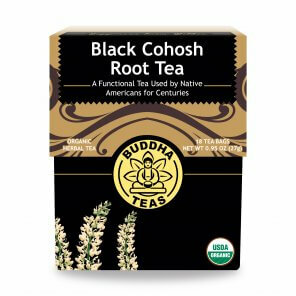 A good boil, 212 degrees F, and a nice long steep, 5 to 10 minutes, will leave you with the perfect cup of Buddha Teas Black Cohosh Tea. Changed my life. I feel like myself again. Helps so much with hot flashes. This is delicious, soothes my belly. Arriving very quickly. I will be ordering again from them. Review Title: Works for me! 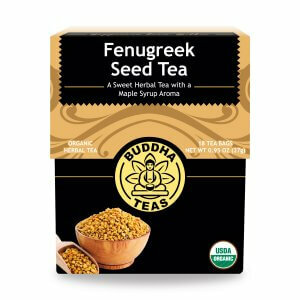 I bought this tea to help sooth hot flashes, and I have noticed a slight difference. There's no better medicine than teas. Review Title: It helps me! 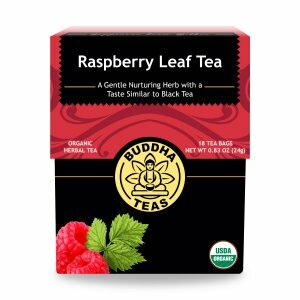 I can tell you for a fact within hours of my first cup I was noticing the effects of this tea! 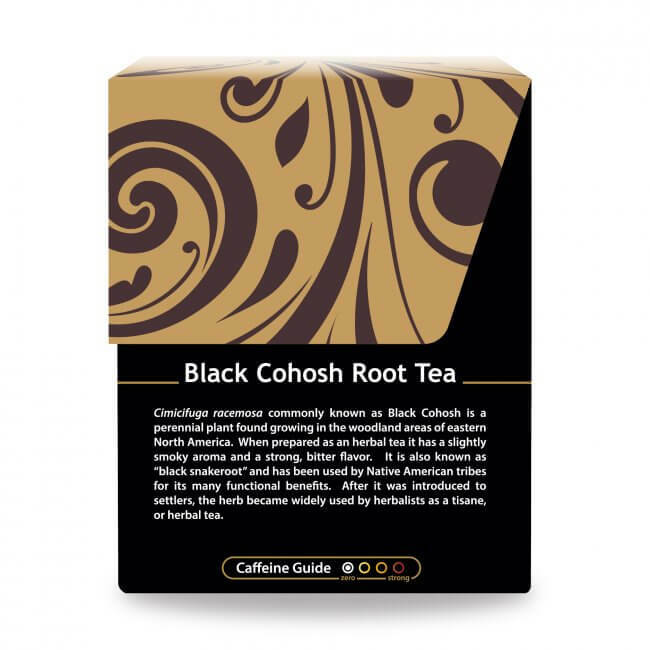 I starting drinking Black Cohosh Root Tea due to change symptoms. My symptoms are in check and I can go on with my daily life without worries. I am so thankful I can control these in a natural way, without resorting to prescription medication. I do have to pay for it, but I would be paying for coffee and other daily drinks anyway, so it compensates, and besides, it is so much better for me. Slightly bitter, but enjoyable taste. 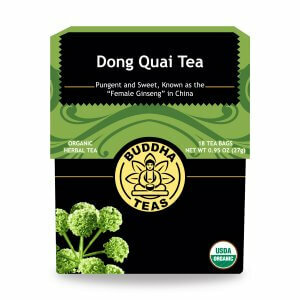 Looking forward to the health benefits of this tea. Very impressed with this experience. It seemed as though I had barely placed my order and it had already arrived. This is a nice, mild-flavored tea. I will definitely order again. WITH A LITTLE HONEY I ENJOY THIS TEA VERY MUCH.....ALSO EVERYTHING ARRIVED IN GOOD TIME AND CONDITION..